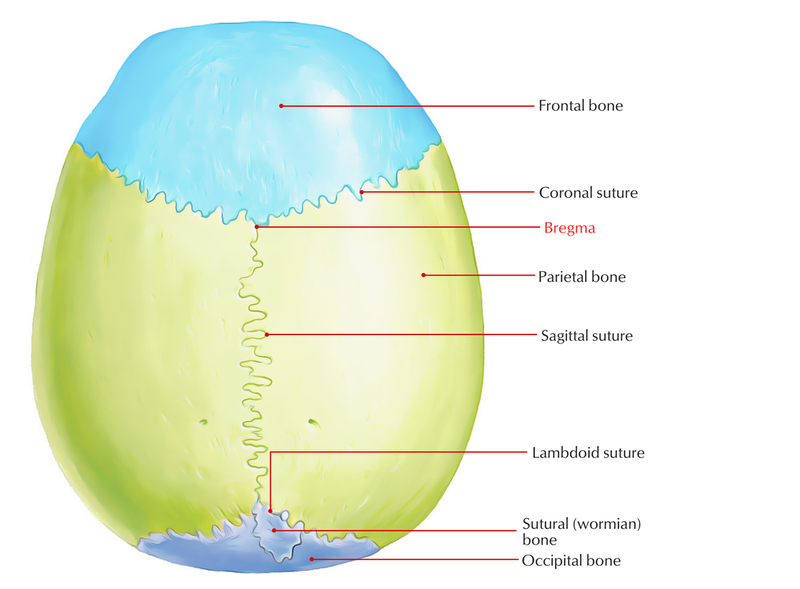 The bregma is bony landmark on the midline where the coronal and sagittal sutures converge, in the middle of the frontal as well as two parietal bones. It is among the vital skull landmarks, craniometric spots for radiological or anthropological skull measurement. It is present in the form of the anterior fontanelle in the newborn and closes in usually near 18 months later birth. The frontal plane is located in the bregma plane. This is a distinct external-internal landmark: a vertical plane which resembles the bregma outside on the skull, and to the pairing of the anterior commissure inside the brain. 1. The anterior fontanelle never merges to create the bregma in the inborn condition cleidocranial dysostosis. 3. Examination of an infant also includes examining the anterior fontanelle. A sunken fontanelle shows dehydration, while a very taut or protruding anterior fontanelle shows high intracranial pressure.